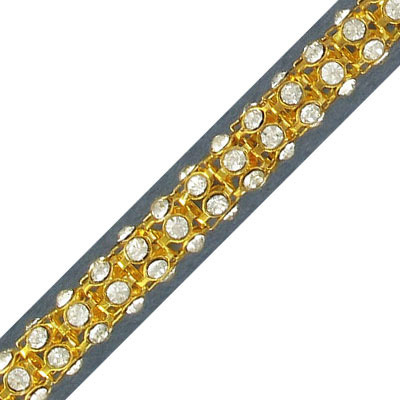 Round chain with crystals, 8mm, gold plate. (SKU# RHCC/8MM/101G). Minimum order is 1 yard. 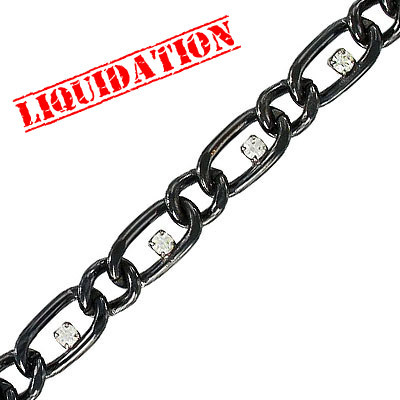 Link chain, with 4x6mm navy bead, rhodium imitation, brass core. (SKU# CC/9352N/WH). Minimum order is 1 meter. 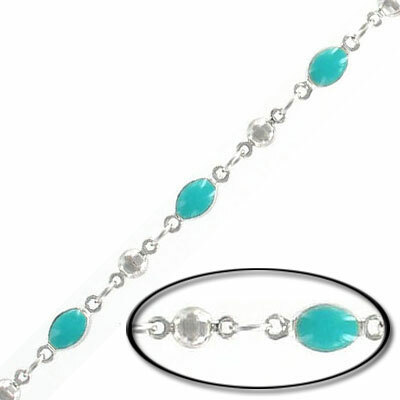 Link chain, with 4x6mm turquoise bead, rhodium imitation, brass core. (SKU# CC/9351T/WH). Minimum order is 1 meter. Link chain, with evil eye, rhodium imitation, brass core. (SKU# CC/9344E/WH). Minimum order is 1 meter. Chain, 4mm star, 4mm purple disk, gold plate, brass core. (SKU# CC/9319P/GL). Minimum order is 1 meter. 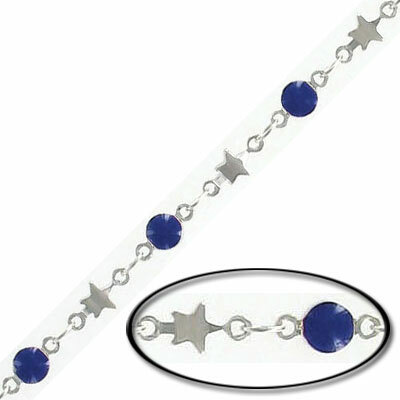 Chain, 4mm star, 4mm purple disk, rhodium imitation, brass core. (SKU# CC/9319P/WH). Minimum order is 1 meter. 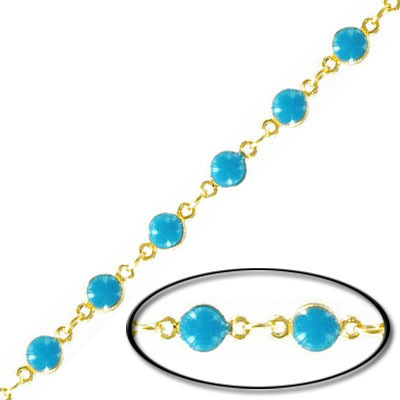 Link chain, with 4mm turquoise bead, gold plate, brass core. (SKU# CC/9376T/GL). Minimum order is 1 meter. 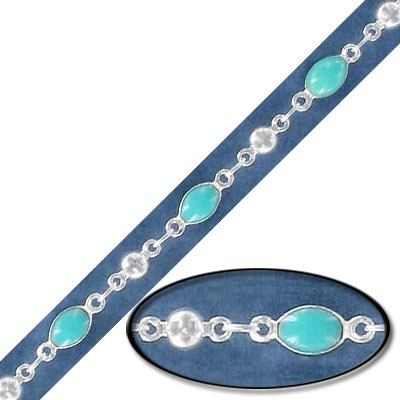 Link chain, with 4mm turquoise bead, silver plate, brass core. (SKU# CC/9376T/SPL). Minimum order is 1 meter. 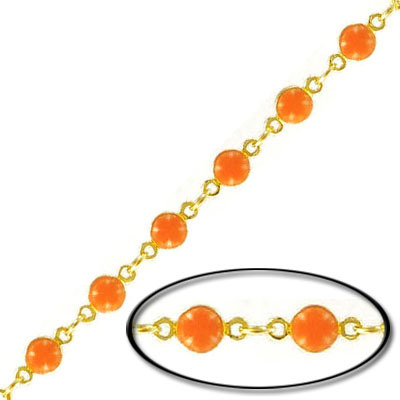 Link chain, with 4mm, orange bead, gold plate, brass core. (SKU# CC/9376O/GL). Minimum order is 1 meter. Link chain, with 5mm flower, gold plate, brass core. (SKU# CC/G227/GL). Minimum order is 1 meter. 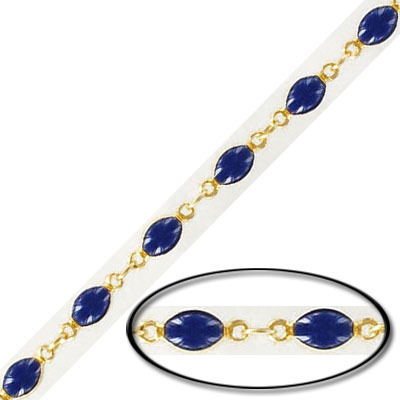 Link chain, with 4x6mm navy bead, gold plate, brass core. (SKU# CC/9352N/GL). Minimum order is 1 meter. 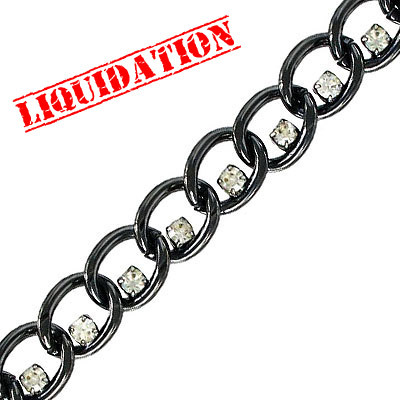 Link chain, with 4x6mm black bead, gold plate, brass core. (SKU# CC/9351B/GL). Minimum order is 1 meter. 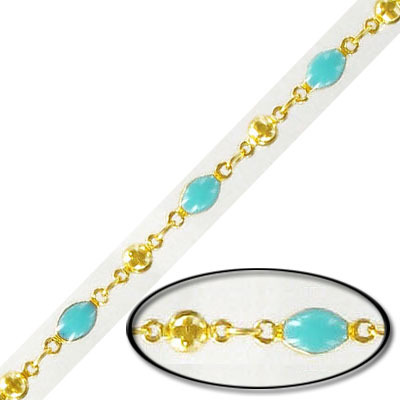 Link chain, with 4x6mm turquoise bead, gold plate, brass core. (SKU# CC/9351T/GL). Minimum order is 1 meter. 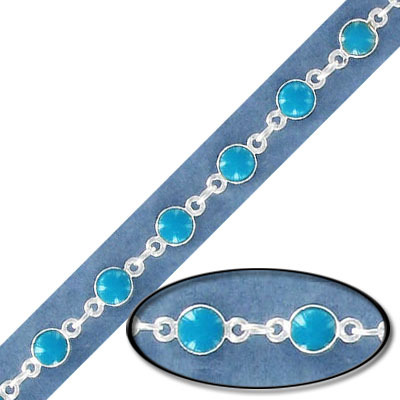 Link chain, with 4x6mm turquoise bead, silver plate, brass core. (SKU# CC/9351T/SPL). Minimum order is 1 meter. 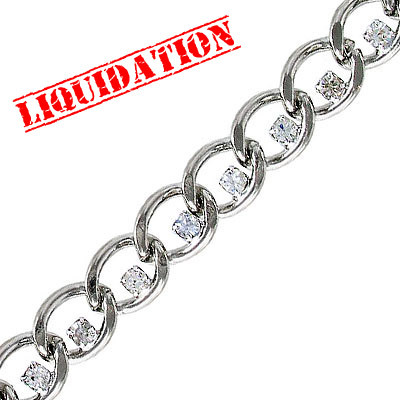 Round chain with jet color stones, 8mm, rhodium imitation. (SKU# RHCC/8MM/212W). Minimum order is 1 yard. 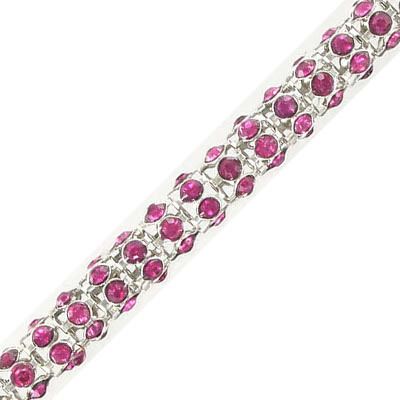 Round chain with fuchsia color stones, 8mm, rhodium imitation. (SKU# RHCC/8MM/208W). Minimum order is 1 yard. 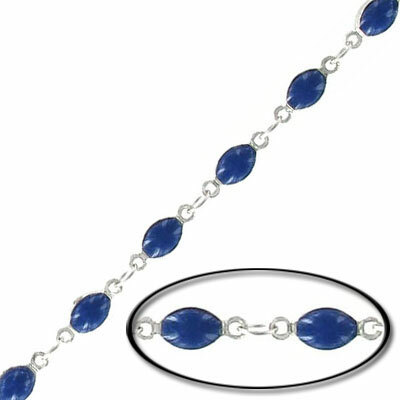 Round chain with sapphire color stones, 8mm, rhodium imitation. (SKU# RHCC/8MM/224W). Minimum order is 1 yard. Swarovski stones chain, length 13.60mm x width 11mm x thickness 2mm, stone size 3.50mm, black nickel finish, crystal, 2 meters, steel core. (SKU# CC/866/101B). Sold per pack of 1 spool(s). Swarovski stones chain, large link: length 16mm x width 7.80mm x thickness 2mm, small link: length 9.80mm x7.80mm x thickness 2mm, stone size 3mm, black nickel finish, crystal, 3 meters, steel core. (SKU# CC/863/101B). Sold per pack of 1 spool(s). 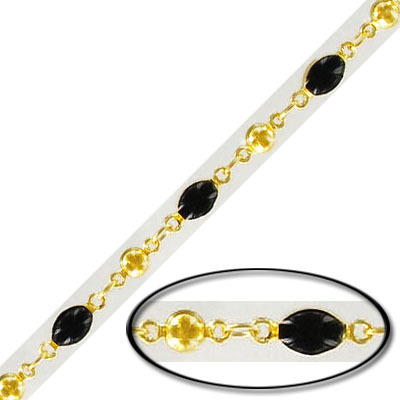 Swarovski stones chain, large link: length 10.70mm x width 7.20mm x thickness 1.20mm, small link: length 6mm x 4.90mm x thickness 1.20mm, stone size 2.50mm, black nickel finish, crystal, 3 meters, steel core. (SKU# CC/859/101B). Sold per pack of 1 spool(s). Swarovski stones chain, large link: length 10.70mm x width 7.20mm x thickness 1.20mm, small link: length 6mm x 4.90mm x thickness 1.20mm, stone size 2.50mm, rhodium imitation, crystal, 3 meters, steel core. (SKU# CC/859/101W). Sold per pack of 1 spool(s). Swarovski stones chain, length 13.60mm x width 11mm x thickness 2mm, stone size 3.50mm, rhodium imitation, crystal, 2 meters, steel core. (SKU# CC/866/101W). Sold per pack of 1 spool(s). 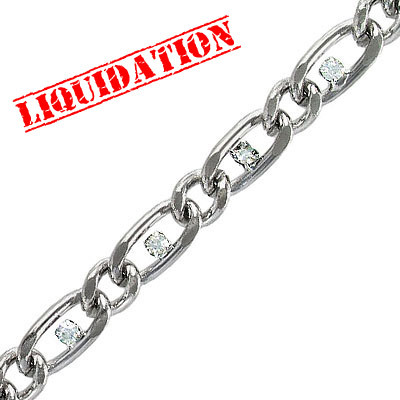 Swarovski stones chain, large link: length 16mm x width 7.80mm x thickness 2mm, small link: length 9.80mm x7.80mm x thickness 2mm, stone size 3mm, rhodium imitation, crystal, 3 meters, steel core. (SKU# CC/863/101W). Sold per pack of 1 spool(s). 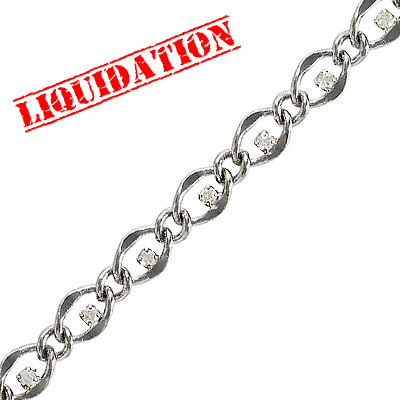 Swarovski stones chain, large link: length 8.20mm x width 5.60mm x thickness 1.20mm, small link: length 5.60mm x width 4.50mm x thickness 1.20mm, stone size 2mm, rhodium imitation, crystal, 3 meters, steel core. (SKU# CC/852/101W). Sold per pack of 1 spool(s).